[S341] Darcy Pinnotti, "E-Mail, Darcy Pinnotti," e-mail to Taute Group, 15 Nov 2001. [S627] Electronic, unknown repository address, HeritageQuest.com, Saratoga twp, ED 126, pg 109, sht 5. [S1006] Electronic, unknown repository address, Ancestry.com, Dawson Twp, ED 84, pg 40, sht 8. [S4] Leonard Clark Blanding, Genealogy of the Blanding Family, pg 78. [S452] A. L. Blanding, Blanding Family, A.L. Blanding, Volume 2, pg 10. [S481] Electronic, unknown repository address, ancestry.com, Sumter Township. [S544] Electronic, unknown repository address, HeritageQuest.com, Sumter Township, pg 176. [S599] Electronic, unknown repository address, HeritageQuest.com, Pg 246. [S4] Leonard Clark Blanding, Genealogy of the Blanding Family, pg 77. [S262] GenForum, online http://genforum.genealogy.com/blanding.html, Blanding, Charles Ketchum, 17 Apr 2000. [S315] LDS Census 1880, online, Sumter, Sumter Co., SC, pg 327C. [S710] Unknown compiler, 10 Feb 2004, Desc chart. [S13] McHenry Co, IL 1850. [S190] Film, 6125 Sand Point Way NE, Seattle, WA, King Co., Pg. 27. [S13] McHenry Co, IL 1850, McHenry Twp pg 500. [S13] McHenry Co, IL 1850, Pg. 500. [S190] Film, 6125 Sand Point Way NE, Seattle, WA, King Co., Clatonia Pct, pg 27. [S242] Ancestry.com, online www.Ancestry.com, Richardson Family Tree, 20 Feb 07. [S194] Film, 6125 Sand Point Way NE, Seattle, WA, King Co., Pg. 232. [S34] Interview, unknown informant, Ellen Nettleton Turner, letter of 29 Nov 43. [S205] Film, unknown location, unknown record info, Clatonia Precinct, ED 319, sht 17. [S243] IL Marriages to 1850, GRS, # 228. [S721] Letter, Roy Davis to Bill Blandin, 29 Nov 1999, 29 Nov 1999. [S205] Film, unknown location, unknown record info, E.D. 319 pg 17. [S958] Find A Grave, online www.findagrave.com, Mem. # 57588334 Created by Polly Cox. [S98] Oliver Nettleton, WA, Death Records. [S194] Film, 6125 Sand Point Way NE, Seattle, WA, King Co., Dekorra Township, pg 232, sht 152. [S42] Unknown short newspaper title, Miranda Blandin. [S958] Find A Grave, online www.findagrave.com, Mem. # 57266334 Created by Polly Cox. [S34] Interview, unknown informant, Steve Krahn E-mail, 14 Apr 2006. [S1075] Electronic, unknown repository address, Ancestry.com, Bunker Twp., pr 115, sht 2A, ED 22-5. [S42] Unknown short newspaper title, Lydia Hoffer Blandin, from WA State Library. [S4] Leonard Clark Blanding, Genealogy of the Blanding Family, pg 213. [S717] NEHGR Web Site, online NewEnglandAncestors.org, Lynn, MA, Vol 5 pg 252, Apr 1851. [S159] Film, 6125 Sand Point Way NE, Seattle, WA, King Co., Henrietta Twp, ED 73, sht 3b. [S37] Unknown name of person, Death certificate, WA State cert # 146-8 (local # 42-827), for Mae L. Iaeger. [S378] Probate, Iaeger, William 374733 (Vol 49 page 104), Affidavid of Margaret A. Skeen that Maye Arrowood Iaeger was born 24 Sep 1889 at Dassel, MN to William and Leena Arrowood (dated 31 Aug 1944). Part of William S. Iaeger King Co. file # 374733, Vol. 49, Pg 104. [S405] Electronic, unknown repository address, Ancestry.com, Edmonds, Ed 19, pg 122B, sht 6B, enum. 11 Apr 1930. [S210] Film, 6125 Sand Point Way NE, Seattle, WA, King Co., Stockholm Township, Pg 626. [S41] Unknown name of person unknown record type, unknown repository, unknown repository address, pg 36. [S42] Unknown short newspaper title, John P. Newman, 23 Jul 1914, transcribed from Cokato Historical Museum. [S1922] Electronic, unknown repository address, Ancestry.com, Edmonds ED 31-25 image 15/34. [S56] Unknown name of person unknown record type, unknown repository, 5701 8th Ave NE, Seattle, WA, King Co., Film # 0082272 C:1, 1861-65 pg 222. [S56] Unknown name of person unknown record type, unknown repository, 5701 8th Ave NE, Seattle, WA, King Co., FHL # 0308503, 1861-1865. [S41] Unknown name of person unknown record type, unknown repository, unknown repository address, Aug 1997. [S56] Unknown name of person unknown record type, unknown repository, 5701 8th Ave NE, Seattle, WA, King Co., Film # 0082272 C:1. [S163] Film, 6125 Sand Point Way NE, Seattle, WA, King Co., Edmonds, ED 129, Sch 5B. [S209] Film, Family History Center, Film # 565732, Pg 447. [S41] Unknown name of person unknown record type, unknown repository, unknown repository address. [S135] MN. Meeker Co., Marriage Cert. : Book D, pg 35. [S138] Film, Everett FHC, FHL # 565746, Dassel Twp, sht 8. [S57] Unknown volume, unknown short title: Wright Co, unknown repository. [S89] 1910 Film, 6125 Sand Point Way NE, Seattle, WA, King Co., ED 226 Pg. 117. [S57] Unknown volume, unknown short title, unknown repository. [S158] Film, Seattle Genealogy Society Library, unknown record info, Pg 1 Sch 4. [S75] Nov 1998 unknown record type, 6125 Sand Point Way NE, Seattle, WA, King Co.
[S34] Interview, unknown informant, Hazel Skutvik. [S34] Interview, unknown informant, Letter from Hulda in Mt. Vernon. [S163] Film, 6125 Sand Point Way NE, Seattle, WA, King Co.
[S405] Electronic, unknown repository address, Ancestry.com, ED 31-19, Sht 10B. [S215] Funeral Home Records, Becks Funeral Home, Edmonds, WA. [S42] Unknown short newspaper title, Edmonds Paper, 31 Dec 1952. [S34] Interview, unknown informant, Maye Arrowood Iaeger. [S34] Interview, unknown informant, Mae Iaeger. [S37] Unknown name of person, Death certificate, WA State cert # 146-8, local # 42-827. [S38] Family Bible, Lena Arrowood. [S1752] Google Books, online, History of Goshen, NH by Walter Ralph Nelson, pg 403. [S1745] Electronic, unknown repository address, Ancestry.com, Goshen, Ed 248, pg 128, sht 9. [S1327] Andor Family Tree, Ancestry.com, David Braman. [S1346] Electronic, unknown repository address, Ancestry.com, Algansee Township ED 93 sht 24. [S1347] Electronic, unknown repository address, Ancestry.com, Algansee Township ED 1 sht 9B. [S1329] MI Hillsdale 1910 Census, Ancestry.com, Camden Township ED 103 sht 2B. [S1327] Andor Family Tree, Ancestry.com, Glyde Braman. [S576] Electronic, unknown repository address, HeritageQuest.com, Rehoboth, ED 222, sht 6B. [S635] Electronic, unknown repository address, Ancestry.com, Rehoboth, ED 173, sht 9B. [S723] Electronic, unknown repository address, Ancestry.com, Rehoboth, ED 3-205, sht 6B. [S858] Mike Cain, 15 Nov 2004, Pedigree chart, 15 Oct 2005. [S1053] Unknown subject Electronic, by unknown photographer, 1750-1772, 9 Feb 1751 Maria Nilsdotter. [S1052] Unknown subject Electronic, by unknown photographer, 1773-1779, pg 152, Nasberget. [S1052] Unknown subject Electronic, by unknown photographer, 1780-1789, pg 48, Bjorby. [S1052] Unknown subject Electronic, by unknown photographer, 1795-1800, Pg 33, Bjorby. [S1052] Unknown subject Electronic, by unknown photographer, 1812-1820, Pg 11, Bjorby. [S1052] Unknown subject Electronic, by unknown photographer, 1750-1755, Nesberget. [S58] Unknown name of person unknown record type, unknown repository, 5701 8th Ave NE, Seattle, WA, King Co., 1795-1800 pg. 33. [S1052] Unknown subject Electronic, by unknown photographer, 1805-1812, Pg 64, Bjorby. [S58] Unknown name of person unknown record type, unknown repository, 5701 8th Ave NE, Seattle, WA, King Co., 1812-1820 pg. 11. [S1052] Unknown subject Electronic, by unknown photographer, 1756-1765, Nasberget, pg 299. [S1052] Unknown subject Electronic, by unknown photographer, 1765-1772, Nasberget, pg 334. [S63] Unknown name of person unknown record type, unknown repository, 5701 8th Ave NE, Seattle, WA, King Co., 1773-79, Pg. 152. [S1052] Unknown subject Electronic, by unknown photographer, 1780-1789, pg 144, Nasberget. [S63] Unknown name of person unknown record type, unknown repository, 5701 8th Ave NE, Seattle, WA, King Co., 1780-89, Pg. 48. [S63] Unknown name of person unknown record type, unknown repository, 5701 8th Ave NE, Seattle, WA, King Co., 1780-89, Pg. 144. [S1052] Unknown subject Electronic, by unknown photographer, 1800-1805, Pg 66, Bjorby. [S58] Unknown name of person unknown record type, unknown repository, 5701 8th Ave NE, Seattle, WA, King Co., 1805-1812 pg. 64. [S1052] Unknown subject Electronic, by unknown photographer, 1790-1795, pg 33, Bjorby. [S1053] Unknown subject Electronic, by unknown photographer, 1778-1825, 27 Feb 1784 Mattes Persson. [S1053] Unknown subject Electronic, by unknown photographer, 1778-1825, 25 Sep 1787 Kjirstin Persdotter. [S1053] Unknown subject Electronic, by unknown photographer, 1778-1825, 16 Feb 1791 Eva Persdotter. [S1053] Unknown subject Electronic, by unknown photographer, 1778-1825, 11 Mar 1793 Per Persson. [S1070] Genealogy.com, online Genealogy.com, Nelson, Donald Alfred Jr. Home Page, 25 Mar 2007. [S974] Obits and Death Notice, online unknown url, Blanding, Robert J., The Roanoke Times, VA, 7 Nov 1990. [S4] Leonard Clark Blanding, Genealogy of the Blanding Family, pg 192. [S4] Leonard Clark Blanding, Genealogy of the Blanding Family, pg 191. [S902] Joseph C. Audenried / Jane Audenried, Audenried Genealogy, pg 41. [S64] Unknown name of person unknown record type, unknown repository, unknown repository address, Anna M. Berger, Laurel Hill Cemetery, from Anne Wagner. [S95] SSDI, online www.Ancestry.com, B. M. McDonald. [S1987] Dave Rodgers, 26 Nov 2013, Bertha Mildred Northrup McDonald. [S958] Find A Grave, online www.findagrave.com, Owen Keith McDonald. [S1987] Dave Rodgers, 26 Nov 2013, Owen Keith McDonald. [S958] Find A Grave, online www.findagrave.com, Sandra G. McDonald. [S815] Film, unknown repository address, NARA, Seattle, Ward 3, pg 197. [S315] LDS Census 1880, online, Wheeler M. Blanding, ED 13 Providence RI, pg 220A. [S34] Interview, unknown informant, Bill Blandin, 3 Dec 2003. [S4] Leonard Clark Blanding, Genealogy of the Blanding Family, pg 212. [S1080] Maggie Antosy Reed, "Iaeger Maggie Reed," e-mail to Bill Blandin, 31 Dec 2007. [S410] 1 Jan 1920 PA Berks Co. 1920 Census, unknown repository address, Ancestry.com, Reading, pg 96b, sht 1b, ED 75. [S4] Leonard Clark Blanding, Genealogy of the Blanding Family, pg 180. [S1607] Electronic, unknown repository address, Ancestry.com, New Rockford ED 266 sht 6b fam 130. [S1608] Electronic, unknown repository address, Ancestry.com, New Rockford ED 14-72 pg 186 sht 16 fam 332. [S236] Letter, Mary Lou Erickson to Bill Blandin, 31 May 1993, Letter of 5/15/00. [S559] Electronic, unknown repository address, HeritageQuest.com, Chicago Ward 34, pg 186. [S1610] Electronic, unknown repository address, Ancestry.com, Julian Township ED 118 pg 69 sht 1 fam 12. [S1611] Electronic, unknown repository address, Ancestry.com, Morris Township ED 60 sht 1b fam 27. [S1612] Electronic, unknown repository address, Ancestry.com, Morris Township ED 3228 sht 4b fam 115. [S435] Letter, Fran Gibson to Bill Blandin, 19 Mar 2003, 19 Mar 2003. [S694] Electronic, unknown repository address, Ancestry.com, Providence ED 244 pg 135 sht 6 fam 143. [S886] Electronic, unknown repository address, Census from Ancestry.com, Providence ED 4-12 pg 1176 sht 31 fam 252. [S1052] Unknown subject Electronic, by unknown photographer, 1745-1720, Nesberget. [S1052] Unknown subject Electronic, by unknown photographer, 1750-1755, Nasberget, farm 27. [S401] FamilySearch, online FamilySearch.com, IGI Individual Record, Film 184684, ref 8450, pg 269. [S1052] Unknown subject Electronic, by unknown photographer, 1750-1755, Näsberget, pg 219. [S401] FamilySearch, online FamilySearch.com, Individual Record, Compact disk 108, Pin 804107. [S401] FamilySearch, online FamilySearch.com, IGI Individual Record, 30 Nov 2006. [S401] FamilySearch, online FamilySearch.com, Individual Record, Compact disk 108, Pin 804109. [S1052] Unknown subject Electronic, by unknown photographer, 1745-1750, Nesberget, pg 157. [S401] FamilySearch, online FamilySearch.com, IGI Individual Record, Film 1239585, ref 6873. [S401] FamilySearch, online FamilySearch.com, IGI Individual Record, Film 184205, ref 17520, pg 764. [S63] Unknown name of person unknown record type, unknown repository, 5701 8th Ave NE, Seattle, WA, King Co., 1773-79, Pg. 156. [S734] Letter, Gerhard Jacobson to Bill Blandin, 8 Feb 2000. [S918] Garhard and Connie Jacobson, Jacobson Family, Ancestor Chart. Mons Olsen Inrenesdal b. 17 Feb 1773, d. 1835? [S858] Mike Cain, 15 Nov 2004, Descendant chart, 8 May 2002. [S734] Letter, Gerhard Jacobson to Bill Blandin, 8 Feb 2000, pg 1. [S734] Letter, Gerhard Jacobson to Bill Blandin, 8 Feb 2000, pg 2. M, b. 17 February 1773, d. 1835? [S858] Mike Cain, 15 Nov 2004, World Connect 15 Oct 2005. [S1053] Unknown subject Electronic, by unknown photographer, 1702-1749, pg 96. [S522] Electronic, unknown repository address, HeritageQuest.com, Racine, ward 5, pg 68 B. [S955] NSSAR, Lamach Blandin, 16 Oct 1990. [S582] Electronic, unknown repository address, HeritageQuest.com, Racine ED 78 sht 10b fam 274. [S42] Unknown short newspaper title, www.coachbuilt.com, Racine Manufacturing Company. [S1283] William Richard Cutter, NE Families, Genealogical, from Google books 12 Dec 2008. [S232] Unknown, RI, History of, pg 497. [S4] Leonard Clark Blanding, Genealogy of the Blanding Family, pg 67. Her married name was Hayse.1 Mary Elizabeth Orwick married John S. Hayse. [S34] Interview, unknown informant, Bill Blandin, 24 Aug 2004. [S363] Electronic, unknown repository address, Ancestry.com, St Paul, ED 114, Sht 7A, pg 7. [S872] Electronic, unknown repository address, Census from Ancestry.com, St. Paul, ED 16, image 54/127. [S982] Electronic, unknown repository address, Ancestry.com, Colorado Springs, ED 14, pg 110, sht 4. [S49] Unknown name of person unknown record type, William Arthur Blandin *, 10535 23 Ave NE, Seattle, WA, pg 245. [S13] McHenry Co, IL 1850, Richmond Twp, pg 447, fam # 7. [S1112] Electronic, unknown repository address, Ancestry.com, From Hugh Stevens Web site, 19 May 2008. [S172] Unknown name of person, unknown ship name Film, 23 Aug to 24 Sep 1855, 16 Jun 1845 on ship "Panama" (1820-1957), 156. [S34] Interview, unknown informant, Roy Blandin. [S13] McHenry Co, IL 1850, Pg 447. [S913] Unknown compiler, Shelley Alsdorf site, 22 May 06. [S172] Unknown name of person, unknown ship name Film, 23 Aug to 24 Sep 1855, 1820-1957, From Hugh Stevens Web site, 19 May 2008, 156. [S958] Find A Grave, online www.findagrave.com, Mem. # 53656695 Created by Phyllis Wallington. [S194] Film, 6125 Sand Point Way NE, Seattle, WA, King Co.
[S373] Web Site, online unknown url, From Hugh Stevens Web site at Ancestry.com, 19 May 2008. [S146] Film, 6125 Sand Point Way NE, Seattle, WA, King Co., Richmond Twp, sht 6. [S146] Film, 6125 Sand Point Way NE, Seattle, WA, King Co.
[S147] Film, 6125 Sand Point Way NE, Seattle, WA, King Co., Richmond Twp, pg 203. [S49] Unknown name of person unknown record type, William Arthur Blandin *, 10535 23 Ave NE, Seattle, WA, pg 294. [S36] Unknown name of person unknown record type, Federal Sale, Arch. Vol No 685, Vol. Page No. 140 unknown repository, unknown repository address. [S13] McHenry Co, IL 1850, Richmond Twp pg 447, Fam # 7. [S39] Unknown author, History of McHenry County, Illinois, pg 913. [S958] Find A Grave, online www.findagrave.com, Mem. # 48772501 Created by Polly Cox. [S39] Unknown author, History of McHenry County, Illinois. [S1011] Electronic, unknown repository address, Ancestry.com, Paton, ED 19, sht 3b. [S67] Unknown short newspaper title, 29 Mar 1955, #1, Jefferson IA, Ancestry.com 3 Sep 2011, pg 3. [S1733] Edmund Wheeler, History of Newport, Google Books pg 420. [S1183] Electronic, unknown repository address, Ancestry.com, Hastings, ED 23, sht 12B. [S1184] Electronic, unknown repository address, Ancestry.com, Bridgewater Township, sht 2B. [S1185] Electronic, unknown repository address, Ancestry.com, Northfield, pg 224, ED 127, sht 12. [S1182] Electronic, unknown repository address, Ancestry.com, Lanesboro, ED 74, sht 42. [S43] Gary Boyd Roberts, Ancestors of American Presidents, Rutherford Hayes, pg 64. [S717] NEHGR Web Site, online NewEnglandAncestors.org, NEHGR Jan 1949, Vol 103, pg 68. [S1435] John Barber White, White Ancestors, pg 157. [S1435] John Barber White, White Ancestors, pg 158. [S43] Gary Boyd Roberts, Ancestors of American Presidents, Rutherford Hayes, pg 61. [S717] NEHGR Web Site, online NewEnglandAncestors.org, NEHGR 1951, Vol 105, pg 229. [S479] Electronic, unknown repository address, ancestry.com, Lafayette Township. [S315] LDS Census 1880, online, LaFayette, Onondaga Co., NY, pg 286B. [S530] Electronic, unknown repository address, HeritageQuest.com, Tully. [S749] Unknown compiler, 16 Mar 2004, 17 Mar 2004. [S811] Film, unknown repository address, NARA, Seattle, Hamilton Township, pg 87, Roll 527. [S838] Film, unknown repository address, NARA, Seattle, North Providence, pg 315. [S1126] Electronic, unknown repository address, Ancestry.com, Corning ED 51-32 sht 14B Fam 338. [S1144] Electronic, unknown repository address, Ancestry.com, Corning ED 104 sht 8B Fam 218. [S357] LDS, CD, Birth Record of Harry Ormsby Blanding, FHL # 1516379. [S553] Electronic, unknown repository address, HeritageQuest.com, Corsicana, pg 164 B. [S611] Electronic, unknown repository address, HeritageQuest.com, Pg 180. [S697] Electronic, unknown repository address, Ancestry.com, Corsicana, ED 148, Sht 3B. [S4] Leonard Clark Blanding, Genealogy of the Blanding Family, pg 124. [S960] Unknown author, unknown subject in "Blanding Message Board," listserve message unknown original date, 1 Mar 09, from patruiz61. [S312] US Gen Web, online USGenweb.com, AZ Death Records, St File # 6258, Harry O. Blanding. [S1079] Unknown name of person, TX Death Index, Ancestry.com 14 sep 08. [S357] LDS, CD, Marriage Record, FHL # 1516379. [S312] US Gen Web, online USGenweb.com, AZ Death Records, St File # 6258. [S4] Leonard Clark Blanding, Genealogy of the Blanding Family, pg 81. [S1327] Andor Family Tree, Ancestry.com, George Palmer. [S1333] MI Hillsdale 1880 Census, Ancestry.com, Camden Township ED 88 pg 84. [S1168] Electronic, unknown repository address, Ancestry.com, Grand Rapids ED 45 pg 146 sht 7. [S869] Electronic, unknown repository address, Census from Ancestry.com, Grand Rapids ED 41-11 pg 254 sht 2. [S1327] Andor Family Tree, Ancestry.com, Cecelia White. [S1328] MI Hillsdale 1900 Census, Ancestry.com, Camden ED 86 sht 18B. [S1329] MI Hillsdale 1910 Census, Ancestry.com, Camden ED 102 pg 57 Sht 3. [S4] Leonard Clark Blanding, Genealogy of the Blanding Family, pg 134. [S4] Leonard Clark Blanding, Genealogy of the Blanding Family, pg 181. [S595] Electronic, unknown repository address, HeritageQuest.com, Syracuse ED 158 pg 169 sht 5 fam 105. [S744] Electronic, unknown repository address, Ancestry.com, Syracuse ED 34-211 sht 4b fam 315. [S266] Iaeger at WorldConnect, online http://worldconnect.rootsweb.comcgi-bin/, Thomas Stobie's page. [S756] Electronic, unknown repository address, Ancestry.com, Reading, pg 110B. [S783] Electronic, unknown repository address, Census from HeritageQuest.com, pg 61, ED 98, sht 8A. [S29] Morton L. Montgomery, History of Berks Co, PA, pg 401. [S902] Joseph C. Audenried / Jane Audenried, Audenried Genealogy, pg 39. [S903] Iaeger Bible, PA Gen Magazine Vol 42 (2002), pg 369. [S34] Interview, unknown informant, Marcia Simmons, Nov 2000. [S64] Unknown name of person unknown record type, unknown repository, unknown repository address, Mary Iaeger. [S900] Electronic, unknown repository address, Ancestry.com, Reading, pg 258b, sht 28, ED 57. [S203] Film, 6125 Sand Point Way NE, Seattle, WA, King Co., Reading, pg 1056, sht 338. [S64] Unknown name of person unknown record type, unknown repository, unknown repository address, Thomas T. Iaeger. [S29] Morton L. Montgomery, History of Berks Co, PA.
[S297] Justine Walter, "E-Mail, Justine Walter," e-mail to Bill Blandin, 3/4/01, Charles Evans Cem Rec. [S783] Electronic, unknown repository address, Census from HeritageQuest.com, Reading, pg 61, sht 8A, ED 98. [S242] Ancestry.com, online www.Ancestry.com, MO Audrain Co. MD records from Ancestry.com. [S1865] Electronic, unknown repository address, Ancestry.com, Linn Twp ED 2 sht 36. [S1866] Electronic, unknown repository address, Ancestry.com, Rush Hill Family 248. [S155] Film, 6125 Sand Point Way NE, Seattle, WA, King Co., Precinct 13, West Eaton. [S160] Film, 6125 Sand Point Way NE, Seattle, WA, King Co., Eaton ED 238 pg 271 sht 3. [S404] Electronic, unknown repository address, Ancestry.com, Eaton ED 62-25 sht 2 pg 180. [S242] Ancestry.com, online www.Ancestry.com, Seigfried Family Tree by Virginiaarnold54. [S1871] Electronic, unknown repository address, Ancestry.com, Batavia ED 50 sht 5B. [S1869] Electronic, unknown repository address, Ancestry.com, Elec Dist 10 ED 11-26 pg 290 sht 3. [S117] Unknown name of person, OR Death Records, 1898-2008, cert # 95-17916. [S34] Interview, unknown informant, Beverly Porter Mar. 1999. [S34] Interview, unknown informant, Beverly Porter, 7 Jul 2006. [S958] Find A Grave, online www.findagrave.com, Mem. # 35107052. 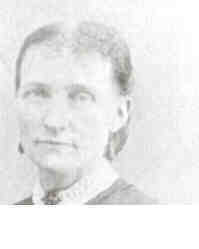 Sarah Minerva Parr was born in August 1860 at IL.1,2,3,4,6 As of circa 1889,her married name was Blandin.7,1,2,3 She married Alanson Jefferson Blandin, son of Willard Blandin and Mary Gamble, on 4 April 1889 at Harker's Corner, Peoria Co., IL.7,1,2,3,4,5,6,8 Sarah Minerva Parr appeared on the census of 1 June 1900 at Logan Township, Peoria Co., IL.1 She appeared on the census of 15 April 1910 at Logan Township, Peoria Co., IL.2 She appeared on the census of 1 January 1920 at Peoria, Peoria Co., IL.3 She appeared on the census of 1 April 1930 at Peoria, Peoria Co., IL.4 She appeared on the census of 1 April 1940 at Peoria, Peoria Co., IL.6 She died in 1959 at Peoria, Peoria Co., IL. [S1958] Electronic, unknown repository address, Ancestry.com, Peoria, ED 104-52, sht 3. [S1987] Dave Rodgers, 26 Nov 2013, Alanson Jefferson Blandin md cert. [S1987] Dave Rodgers, 26 Nov 2013, James Russell Blandin. [S1987] Dave Rodgers, 26 Nov 2013, John Henry Patterson. [S971] WW1 Draft Reg. 1917, WW1 Draft Reg, John Henry Patterson. [S1987] Dave Rodgers, 26 Nov 2013, Bertha Sophia Blandin.